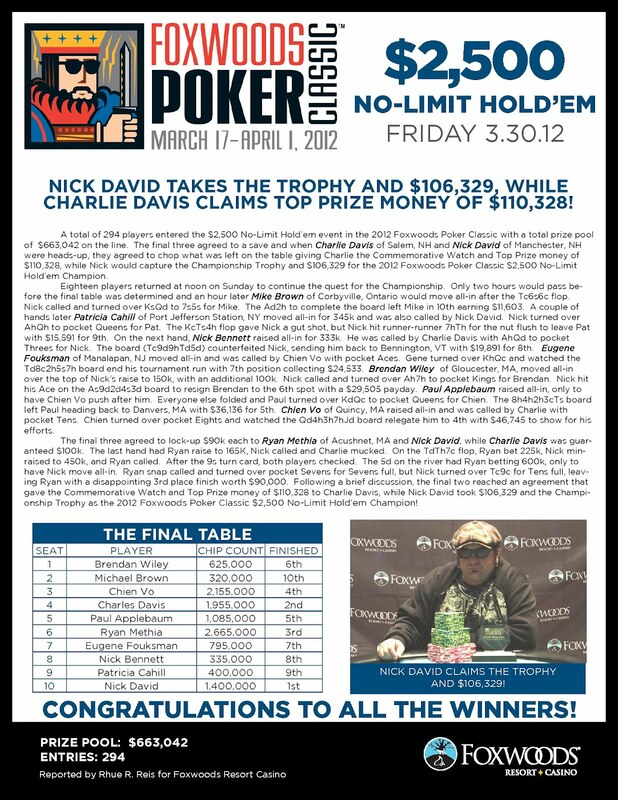 Ryan Methia raises to 165,000 before the flop and Nick David calls. The flop come [Td][Th][7c] and Methia bets 225,000. David min-raises to 550,000 and Methia calls. The turn comes the [9s] and Methia checks. David checks back and the river comes the [5d]. Methia flopped a full house but David turned a better full house, taking the pot. Ryan Methia is eliminated in 3rd place for $90,000. The final three players have come to an agreement on a save. 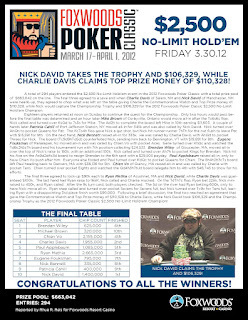 Charlie Davis will lock up $100,000 while both Ryan Methia and Nick David will lock up $90,000. The winner will take home the remaining $26,657. The board runs out [Qd][4h][3h][7h][Jd] and Davis takes the hand with his pocket tens. Chien Vo is eliminated in 4th place for $46,745. The board runs out [8h][4h][2h][3c][Ts] and Vo takes the pot with his pair of queens. Paul Applebaum is eliminated in 5th place for $36,136. The board runs out [As][9d][2d][4s][3d] and David pairs his ace to win the pot, eliminating Wiley in 6th place for $29,505. The board runs out [Td][8c][2h][5s][7h] and Vo takes the pot. Fouksman is eliminated in 7th place for $24,533. The blind are being increased to 25,000-50,000 with a 5,000 ante. The average chip stack with seven players remaining is 1,680,000. The board runs out [Tc][9d][9h][Td][5d] and the pocket threes of Bennett get counter fitted. Nick Bennett is eliminated in 8th place for $19,891. The board runs out [Kc][Ts][4h][7h][Th] and Cahill lets out a celebratory yell, not noticing that David made runner runner flush to win the pot. Cahill is eliminated in 9th place and takes home $15,591. The turn is the [Ad] and the river comes the [2h]. 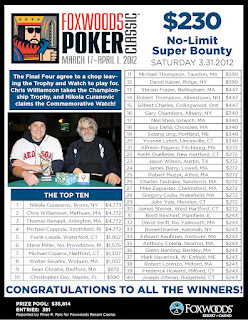 David wins the pot, eliminating Brown in 10th place for $11,603. Shortly after losing a huge pot with A-K to Brendan Wiley's [Ah][9h] all-in before the flop, Mike Leah has been eliminated from the Main Event in 11th place for $11,603. Players are now redrawing for seats at the final table. Andy Stone has been eliminated in 12th place for $11,603. The final day of the $2,500 Foxwoods Poker Classic is now underway and streaming live. To watch the stream, just click on FoxwoodsLive.com. 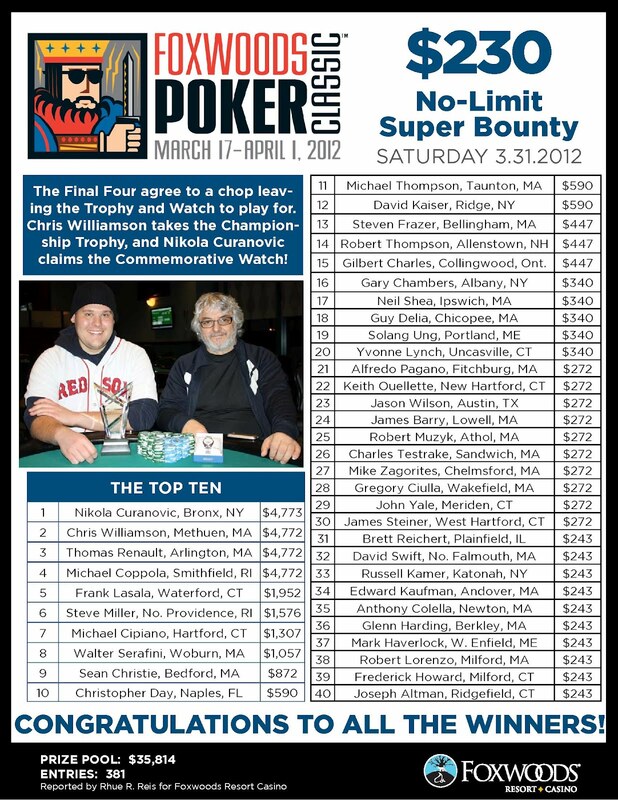 The final day of the $2,500 Foxwoods Poker Classic Main Event is set to begin at noon today. There are 18 players remaining and the average chip stack is now 653,000. The blinds will be 12,000-24,000 with a 4,000 ante. 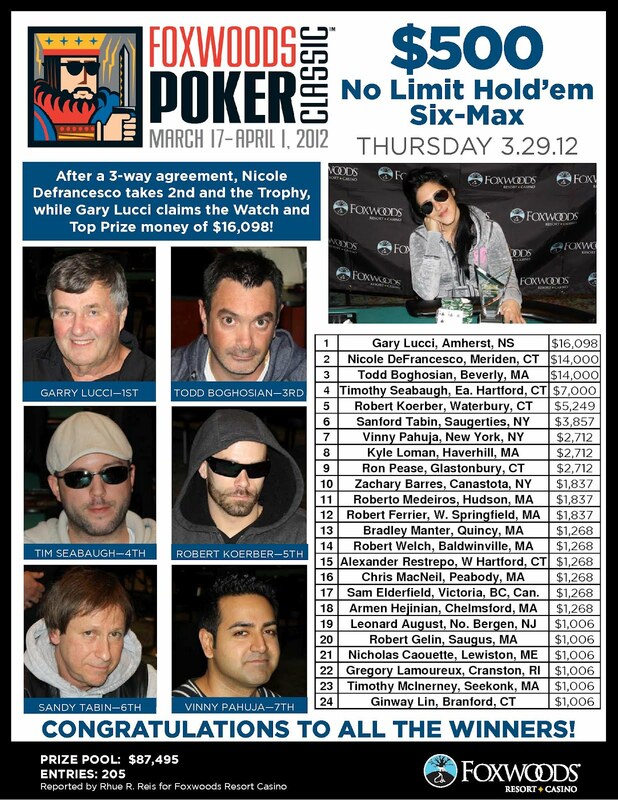 Play has come to an end on Day 2 of the Foxwoods Poker Classic Main Event. 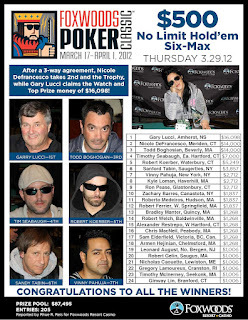 Final chip counts and Day 3 seat assignments will be posted shortly here on FoxwoodsPoker.com.